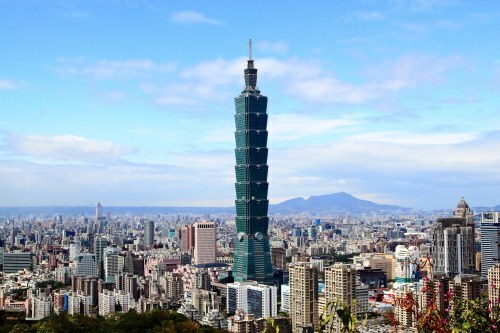 United has dropped the price of their flights from Toronto to Taipei, Taiwan down to just $592 CAD roundtrip including taxes. This same price drop occurred back in November 2016. It was only around for a few hours before disappearing. 2. Click through from Google Flights to the United Airlines website. You can also fly from Toronto to Taipei, Taiwan and then home from Beijing, China for a total price of $504 CAD roundtrip including taxes. The flight from Taipei to Beijing is not included. However, you can get creative, and look for cheap flights within SE Asia to make your way from Taipei to Beijing, and visit another country along the way. For under $800 CAD total, you can build a trip that allows you to visit Taiwan, another country in SE Asia, and China. Another variation would be Taipei to Kuala Lumpur, Malaysia (KUL) and then Kuala Lumpur to Beijing. You should be able to find each flight for around $100 CAD on Air Asia. 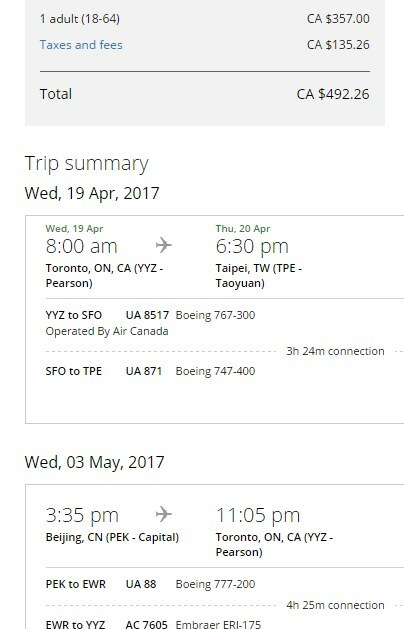 Update 2/11 - You can now find roundtrip flights from Toronto to Taipei, Taiwan for $557 CAD roundtrip including taxes. And flights where you fly home from Beijing, China instead for $492 CAD. Click on the departure date box to open up the calendar view and search for cheap date combinations. 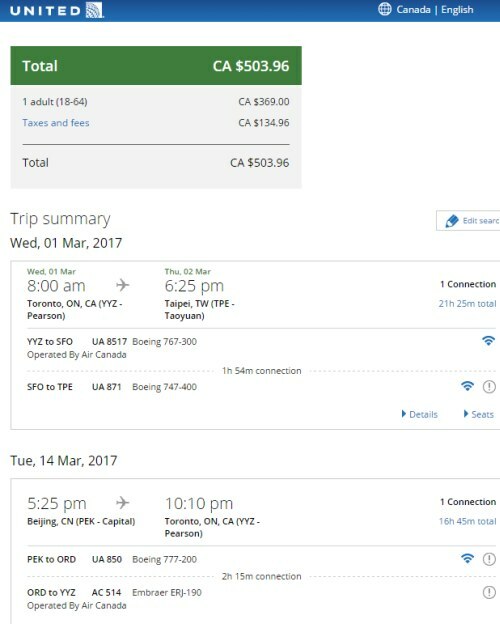 Look for the dates that are $592 CAD roundtrip. Once on Momondo, you may want to use the Stops and Max Flight Duration filters on the left. You can also fly from Toronto to Taipei, Taiwan and then home from Beijing, China for a total price of $492 CAD roundtrip including taxes. 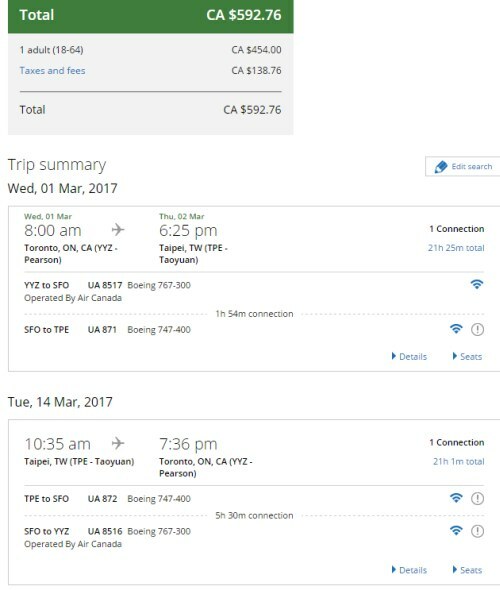 toronto, yyz, flight deals, asia, taipei, taiwan, tpe and united airlines. 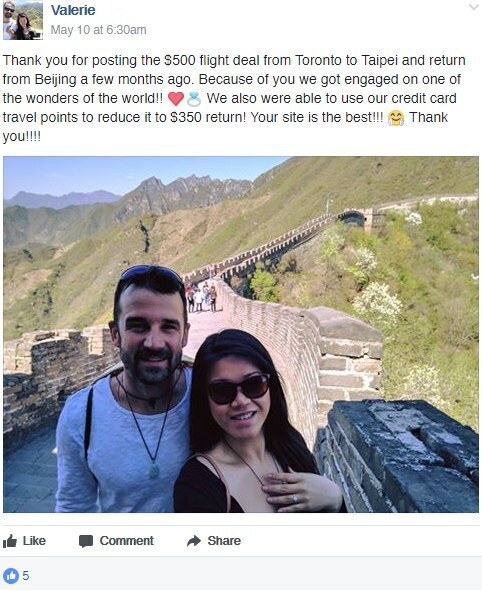 2 Responses to "Toronto to Taipei, Taiwan - $557 to $592 CAD roundtrip including taxes (or home from Beijing for $492)"
Thank you for this deal! It was still available after 10 days you published it, and I booked it :-) Never imagined going to Taiwan for less than $CAD 600. The connection is very convenient too. No problem Lana! Yes, this one has stuck around for a while. Have a great time in Taiwan.